This is part of a series of interviews with our amazing volunteers. These are ordinary Members of Doula UK, who do extraordinary work, often very much behind the scenes, to run our organisation. How long have you been a doula? and/or what was your path to doulaing… what did you do before? The first birth I attended was in 2006 in Guatemala, where I was living with my young son and husband in San Marcos La Laguna. My friends birth experience was transcendental! It opened my eyes to the profound spiritual dimension of birth from a different perspective. The Mayan midwife attending suggested I should train as a midwife, and offered to be my mentor. But with a young child it didn’t feel like the right time. I later returned to the UK and ‘discovered’ doulas! Training with Olivia Seck of Birthing Wisdom in 2011, then writing my first book in 2012 was a wonderful experience. Before being a doula I had been working at a Holistic Centre giving massage, Kinesiology, Reiki, EFT & reflexology. I also worked at a meditation centre specialising in long retreats into the Kabbalah, Hermentic laws & tarot. Before that I taught English as a foreign language in Mexico & Spain. Before that I was a backpacker, visiting sacred sites around the world, spending time in ashrams and with native people. I was born in the UK but left to travel aged 17. I spend a lot of time at home working in the vege garden, processing harvests, preparing food, gathering herbs, foraging the hedgerows & coastlines. I am also one of a group of people who run the local home birth support group and am involved with my local hospital organising meetings between birthworkers & NHS midwives. I hold online space for ‘a cuddle of doulas’ which has created an international peer support group for doulas. My other great love is women’s circle and holding sacred space for ceremony. I regularly hold circles and retreats from my land, and plan to do a lot more in the coming years as the very special yurt in our woods is completed…. watch this space! I have a long history of travel and experience of ceremony, the states of consciousness fascinate me (which is what my second book was about). I hope, through ceremony, to provide a container for consciousness to shift, to deepen and provide an opportunity for connection, with self, with others and with the Sacred world around us. This can happen in birth when the natural hormones flow, you’ve probably seen it as a woman progresses into deep labour and her attention goes within. 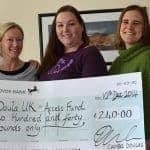 I started being the Rep for Doula UK in Devon two years ago, organising local gatherings and welcoming new members, being a port of call. I have also been Doula UK’s European Doula Network Rep since 2016. The EDN is comprised of 41 Associations and Trainings across 25 countries working together to improve birth across Europe and beyond. I attend meetings, follow Google groups and provide a link between countries. Signposting is one of my superpowers! It changes through the year. In a busy week maybe ten hours, or if it’s a conference weekend that will be three days’ long – fun but can be exhausting. Other weeks I might spend less than one hour. I love being part of something bigger than myself, a worthy cause. It’s a funny thing about doulas, never mind what language, what culture we come from, there often seems to be a shared commonality or compassion and care, of being able to hold space for someone else, and also a core of strength to advocate when needed. Doulas rock! The challenges are being part of something bigger, a huge organisation made up of volunteers is that sometimes things don’t happen as quickly as I’d like! I have to accept that we are an eclectic bunch of individuals and not everyone sees the world the same way I do. The other big challenge is lack of membership participation, I put hours into writing emails, admin for Facebook group, and organising meetings, and sometimes it feels like no-one is even listening as response can be so low. I’ve been very open about this with my local group and I’m really pleased that more are joining in now and it feels like we are creating a real doula community. But it has taken time and effort and holding strength in my values. I believe in community. One of my heroes is Brene Brown who in her book ‘Daring Greatly’ quotes Theodore Roosevelt, The Man in the Arena speech. This gives me strength to keep on doing what I believe in because when I fall, and I will fall, because if we keep doing things long enough we will certainly fall at some point. This helps me get back up again. I want to be in the arena. You can read Hazel’s Doula UK profile here.